Accessories: Accompanied by original fitted box, original guarantee dated 8 May, 1954 and Vacheron Constantin Extract from the Archives confirming the production of this watch in 1952. The apposition of the retailer’s name on the dial of a watch was a privilege given to the most important and prestigious retailers of a brand, increasing the rarity and desirability of the watch. Whereas with Patek Philippe and Rolex, the other two great Geneva based brands, watches with double signatures do show up on the international auction market from time to time, it seems that Vacheron Constantin was more reserved in this type of co-branding. This is why the present reference 4178, with the Türler signature, is such a rare piece. 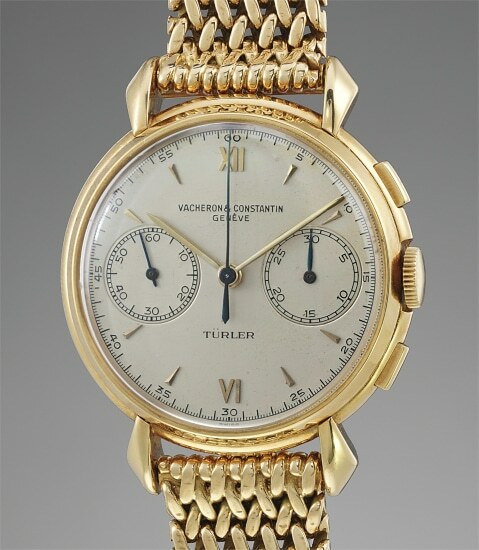 The rarity and appeal of this gorgeous chronograph are further enhanced by the original Gay Frères gold bracelet, stamped 4.52 corresponding to the date of manufacture of the watch, as well as the presence of its original box and papers from Türler confirming the sale of the watch with gold bracelet. Türler is a Swiss-based, family-owned, jewelry and watch retailer founded in 1883 selling some of the most prestigious watch brands. Considered by scholars and collectors as one of the most beautiful vintage chronographs, the Vacheron Constantin reference 4178 entices with its perfect proportions, balanced design and signature facetted lugs. In production from 1940 until 1964 reference 4178 was made in yellow gold, pink gold, steel and a mix of steel and gold with a variety of different dial designs. There is a certain romanticism about vintage timepieces because they each tell a story. The present watch has the date 8 Mai (May in German) 1954 engraved on the caseback (which is the date of purchase), was it a wedding gift, a birthday present or a date celebrating an important milestone? This will remain a mystery but exactly 65 years and almost to the exact date this rare and attractive watch will join a new collection where it will certainly occupy a place of honor. The world's oldest watch brand in continuous operation since its founding in 1755, Vacheron Constantin was the first watch company to manufacture movements with interchangeable parts beginning in 1839. Vacheron's watches are admired for their Latin-influenced case designs, well-balanced proportions and exquisitely finished movements of the highest quality. The Geneva-based manufacturer is known for their highly complicated masterpieces, including the King Farouk Grand Complication made in 1935, the Tour de l'Ile that was the most complicated serially produced wristwatch when introduced in 2005 and the 57260 — the world’s most complicated watch — made in 2015. Key vintage models include minute repeating wristwatches such as the references 4261, chronographs such as the references 4178 and 6087 and the oversized Cioccolotone models such as ref. 4737. Collectors also appreciate Vacheron's Chronometer Royal pocket and wristwatches, as well as the '222,' the brand's first luxury sports watch produced from 1977 through 1984.